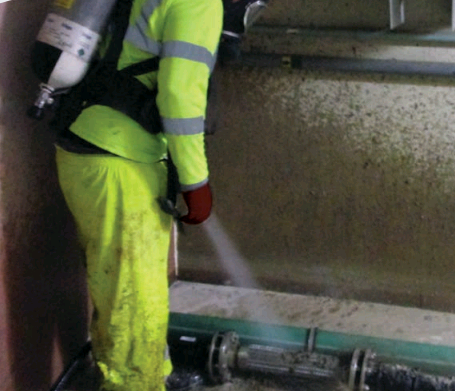 Lanes Group drainage engineers used breathing apparatus to enter a section of one of the UK’s largest residual household waste treatment facilities and clear more than 170 tonnes of organic waste. A team from the Lanes Group depot at St Neots, in Cambridgeshire, was called in to carry out the nine-day project in the mechanical biological treatment plant at the Waterbeach Waste Management Park. The sophisticated recycling centre, operated by Amey, can process up to 200,000 tonnes of residual household waste per year, recovering plastics and metals for recycling, and composting the organic waste. Amey commissioned Lanes Group to clean a process water overflow area in the composting unit, which captures and holds different types of organic material, including solids and leachates, before it is fed back into the processing system, or sent for authorised disposal. Mark Clutterbuck, Area Development Manager for Lanes St Neots, said: “This unconventional task demonstrates the wide variety of projects our specialist teams and equipment can tackle, with great success. The process water overflow area was 200 metres long and 10 metres wide. It had been designated by Amey as a confined space because the waste material could give off potentially harmful gasses, so full breathing apparatus had to be used. The length of the building, and the nature of the waste material – a mixture of solids, sludge and liquids – was also a challenge. The solution was to deploy a jetting and vacumation vehicle called a DISAB Centurion, which has a liquid ring pump, giving it additional suction power over long hose runs. The machine is capable of removing a large variety of waste, including powders, ash, granular material, sludge and aggregates, even rubble. A standard jet vac tanker worked alongside the DISAB to provide water jetting. A risk assessment and method statement to allow the Lanes teams to work in a potentially hazardous area was agreed with Amey. A three-person confined spaces team, all wearing breathing apparatus, worked in rotation. While one drainage engineer operated the jetting and vacuumation hoses, a second provided support, and a third stood in reserve. All three were in line of sight at all times. As part of this work, 20 sumps, measuring 1.5 metres deep and two metres square, were pumped out. The same confined entry techniques were used to clean a 247 cubic metre leachate tank on another floor. While this work was underway, atomiser machines were used to spray a fine mist of water around the jet vac vehicles to supress odours, so the impact of the clean-up work on local residents was minimised.